St. Patrick’s Day at Tommy Condon’s! 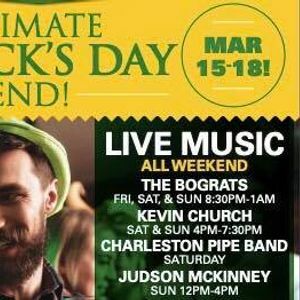 Join us for the BIGGEST and BEST St. Patrick’s Day Celebration in Charleston! The party starts Friday, March 15th and the party continues till Monday! The doors open at 9am Sat, Sun and Mon and the party will go to 2am each night! We will have live music all day, all weekend, featuring Judson McKinney, Kevin Church with headliners The Bograt’s! With a special performance by the Charleston Pipe Band on Saturday leading up to our yearly countdown to St. Patrick’s Day at midnight on Saturday! Enjoy our special Paddy’s Day menu and the coldest beer in town! Dress in your best green outfits and come get your Irish on!! !